As we all get finished with our taxes so do the President and First Lady. 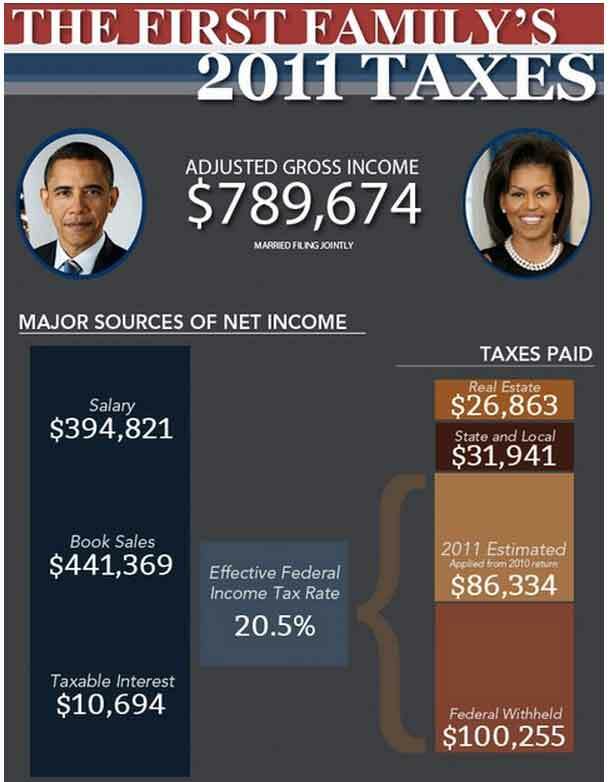 It turns out that the Obama’s came in with a 20.5% tax rate on income of $789,674 (married filing jointly), including donations worth $172,130. The bulk of that income came from presidential salaries, $394,821, and book sales, $441,369. In 2010, their income was $1.7 million with the increase due to book sales, and in 2009, it was more than $5.5 million from book sales and Barack’s Nobel Peace Prize award money. In comparison, Mitt Romney pulled in an estimated $20.9 million in 2011, and is paying a %15.3 tax rate on that. It seems that both our politicians are paying lower rates than average Americans.